Osteopathy is a form of manual healthcare that recognises the important link between the structure of the body and the way it functions. Osteopaths focus on how the skeleton, joints, muscles, nerves, circulation, connective tissue and internal organs function as a holistic unit. As an Osteopath and Clinical Pilates instructor I regularly see mothers suffering from neck, shoulder, back and hip pain as a result of carrying their children. The demands of a mother are constant and require optimal muscular strength and posture to reduce stress on the muscles and joints. 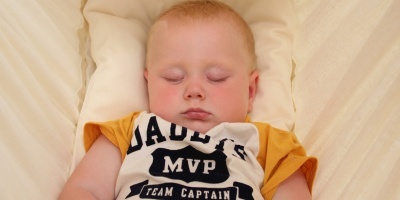 Early on in my practice I began to see the benefits of using a baby sling. 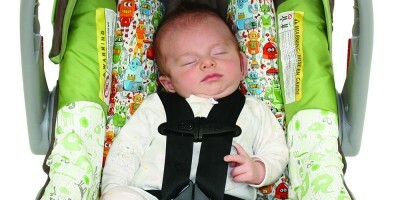 There are many carriers on the market that are aimed at reducing the physical stress on the parent while allowing the parent to stay hands free. 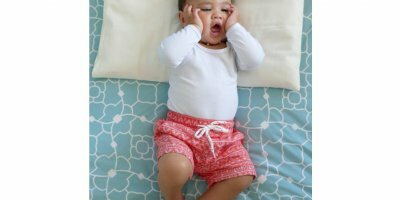 The most common baby carriers we see are pouches, wraps and slings and now there are so many brands on the market it can be difficult to know which is right for you and your baby. When I first started my research into the products that most suited my Osteopathic beliefs I landed very quickly on the Natures Sway website. Immediately I was drawn to their philosophy as it fitted very closely with the holistic nature of my practice. Kate Hornblow, Natures Sway founder and director, developed her products from not only her own requirements as a mother but by looking back at age-old traditions, particularly those of the Malays and Singaporeans who have been using slings and hammocks to support, comfort and carry their babies for centuries, regardless of the technological changes of modern times. During my analysis of baby carriers I fell in love with the fact that Natures Sway has a modern take on the traditional baby sling. Unlike pouches, wraps and other branded slings, the Natures Sway baby sling has a “one-click-and-you’re-in” concept. It can be put on in a hurry and there is no hassle repeatedly taking it on and off. Parents, grandparents or friends are going to use the sling with ease and are unlikely to get confused, or be likely to use the sling incorrectly. The sling is also lightweight and compact compared to other carriers. It can be put in you hand bag or under your pram making it easily transportable and always accessible. I’m a big believer in organics and natural products for health and well being, so the natural materials such as hemp and cotton and the fact that it is proudly NZ made signifies to me quality and endurance. Unlike synthetic products the natural materials breathe well, are comfortable and non-irritable on the skin and naturally move to the contours of mother and babies bodies. When tested the sling washed well and no matter how much I pulled and stretched at it its integrity did not change. The natural material of the sling comfortably cradles the baby or child. As the sling has no in built supports it works with the natural contour of the mother and child instead of forcing the baby into a generic position. When in the cradle position the sling promotes the “c-shaped” nature of the baby’s spine. In the cradle position the babies bottom should be in the deepest part of the sling and its head towards the shoulder strap. This prevents the baby folding in half and pressing its chin into its chest. In the upright position the babies tummy and chest should be against the mother and the babies back in a natural position. In the upright position the baby is naturally shifted into the “frog leg” posture where the hips are separated and knees and hips flexed for healthy hip positioning. If the hips are forced together and extended this can cause damage to the fragile elements of the hip leading to hip dysplasia (most common under four months of age). Carrying you baby on you has many benefits beyond its convenience. Once of the most important is breast-feeding support. When a baby is swaddled it cannot interact with its mother, the way nature intended. With intimate contact, the mother and the baby exchange sensory information that stimulates “baby” behaviour: rooting and searching the breast, staying calm, breathing more naturally, staying warm, maintaining body temperature and maintaining blood sugar. The sling can also block out external stimuli for a distracted baby and provide privacy when feeding in a public environment. Developmentally the baby sling promotes physical development as the infant is in tune with the rhythm of the mothers breathing, the beat of her heart and her physical movements. The sling is in essence a “transitional womb” for the new baby, who has not yet learned to control his bodily functions and movements. Research has shown that premature babies who are touched and held gain weight faster and are healthier than babies who are not. In indigenous cultures where wearing babies in slings is the norm, babies often cry for only a few minutes a day – in contrast to Western babies, who often cry for hours each day. Crying is exhausting for both the baby and parents. Babies who do not need to spend their energy on crying are calmly observing and actively learning about their environment. Baby wearing is especially useful for colicky babies who are far happier being worn. The gentle pressure on the tummy helps to keep stomach acid and milk down. When recommending and fitting a sling to me patients I am looking at 5 key aspects as remembered by the TICKS acronym. Firstly, the sling should be fitted nice and TIGHT. Any slack will cause the baby to weigh down on the mother. This not only puts pressure on her shoulders and spine, stooping her posture and leading to headaches and muscular pain but can also hinder the babies breathing. Secondly, the baby’s face should be IN VIEW at all times. The fabric of the sling should be open around the face to prevent suffocation. In the cradle position the baby should be facing up not towards you. The baby should be CLOSE enough to kiss, by keeping the baby high on your chest you should be able kiss the baby on the head or forehead. This will ensure the baby is again not going to be enclosed by the sides of the sling. Next we KEEP the babies chin off their chest. There should always be space for a finger width under the chin. And finally, the sling should SUPPORT the babies back. This can be tested by pressing gently on the babies back – it should not uncurl or become closer to the mother. 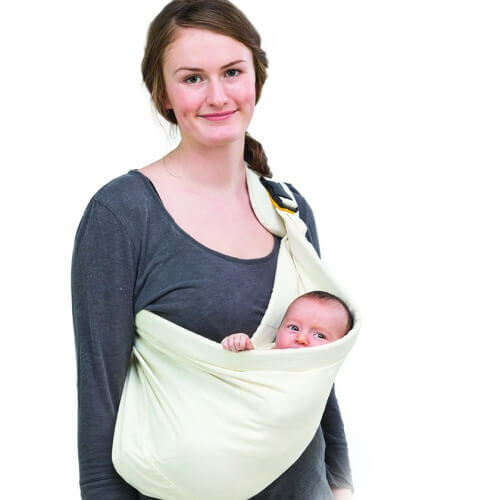 When fitting a sling to the mother, the concept of the sling is based on counter balance where the weight of the child is offset by the shoulder strap. The Natures Sway sling has a padded, broad shoulder strap that helps to distribute weight across the shoulder. 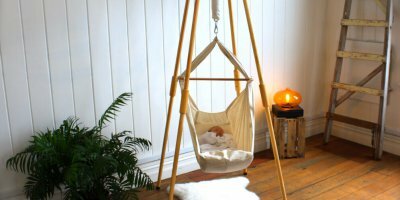 The beauty of the sling is that so long as it fits snugly and the baby is positioned safely (as above), it doesn’t need any other adjusting as its genius is in its age-old design, constructed to fit naturally to the contours of both mother and baby. 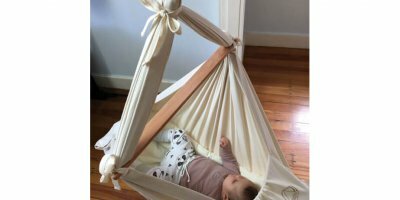 While I love using the sling for shorter trips, around the house, and to distribute the weight of breast-feeding, it was less ideal than a pouch for longer walks or hikes. I could not be happier with the design, concept and quality of the Natures Sway Sling. As we say in Osteopathy “structure and function are reciprocally interrelated.” Therefore the function of the body is dictated by the structure and abnormal structure can lead to dysfunction. The predominant expression of life is movement and to permit healthy motion there must be freedom of movement. The sling is the closes natural expression to this and I am honoured to endorse such a genuine product.